Have you heard that honey bees are in decline? If you’ve also been wondering what’s going on with the bees too, I did some research on the EarthJustice website to inform us of the facts behind the rumor that honey bees are disappearing. I decided to re-type this article for you that I found quite informative, and then I added a few steps at the bottom that we can take to help the bees, and in turn, help ourselves. The information from this post, and the pictures, are taken from this page on the EarthJustice website, and a few other sites linked from that page. Hope you enjoy! PS – It’s Earth Week! Join in by promoting awareness of Climate Change, taking action for sustainability, and reading the rest of the Love the Earth series. 🙂 Peace! 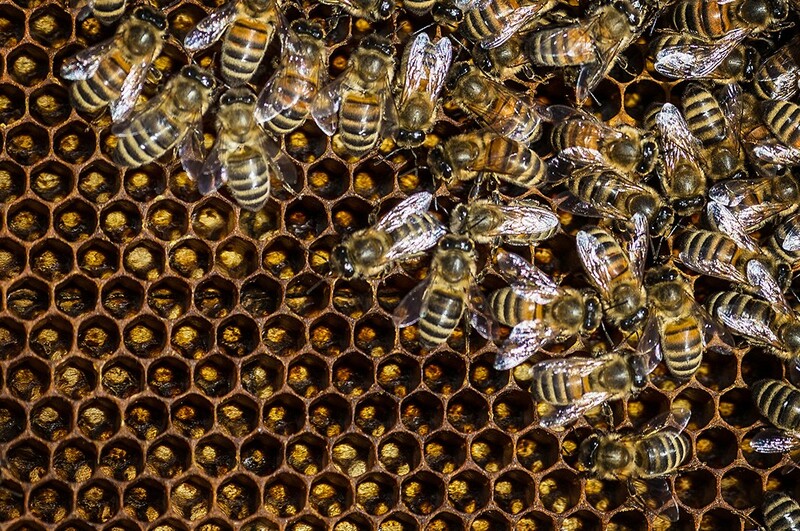 While bee disappearances have occurred throughout the history of beekeeping, the mid-2000s events represented astounding losses, with researchers estimating that nearly one-third of all honey bees in America vanished. Colony Collapse Disorder (CCD) is the term of this widespread bee disappearance. 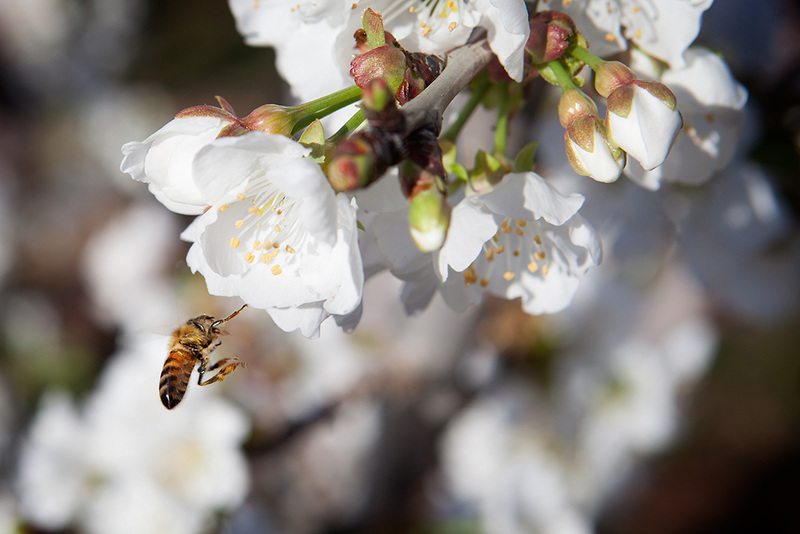 CCD has been attributed to a number of causes, but for many beekeepers across the world, a primary suspect is a class of pesticides known as neonicotinoids. These chemicals, such as Sulfoxaflor, a neonicotinoid insecticide that shows extreme toxicity to bees, came onto the market in the late-1990s and were approved in 2000 for application to corn. It is now estimated that 90 percent of all corn seeds are coated with German agro-chemical manufacturer Bayer’s neonicotinoid pesticide. With the rise of the chemical’s use, there has been a steep drop off in honey production in areas of the US where corn production is prevalent. A growing body of studies show that neonics, even in low doses, impair bees’ ability to navigate. The foraging worker bees that come into contact with the pesticide may get disoriented, flying around until they eventually run out of gas, lost in the field (which explains their disappearance). With a loss of worker bees bringing food back to the hive, the entire colony suffers. How can the use of a toxic pesticide on a crop like corn affect bees, that don’t pollinate the crop? Here is one explanation. In 2008, a neonicotinoid named Clothianidin caused a die-off of hundreds of nearby honey bees colonies. Investigation into the incident revealed that the die-off was caused by a combination of factors, including the failure to use a polymer seed coating known as a “sticker”: weather conditions that resulted in late planting of corn while nearby canola crops were in bloom, attracting honey bees; use of a particular type of air-driven equipment used to sow the seeds, which blew Clothianidin-laden dust off the seeds and into the air as the seeds were ejected from the machine into the ground; dry and windy conditions at the time of planting, which blew the dust into the nearby canola fields where honey bees were foraging; and a higher application rate than had been authorized was used to treat for a severe root worm infestation. Here’s a shorter explanation. The ubiquitous pesticides appear to affect bees in two ways: in big lethal doses that occur at the time of seed planting, when neonic-infused dust wafts around in growing areas; and in tiny doses that happen when bees bring neonic-infused pollen into hives, which don’t kill them immediately but appears to damage their immune systems and homing abilities. Nearly one-third of our crops—including many vegetables, fruits, nuts, and seeds—depend on bees for pollination. Some of these crops, such as sunflowers, are sprayed with neonics, which even more-so directly affect the bee colonies which they rely upon for pollination. Additionally, Bayer’s neonics are also common in home-garden and landscaping products. Many of the plants available for sale at Home Depot, Lowes, or other garden supply stores have been treated with neonicotinoids. Lawn fertilizers also frequently contain weed-killing substances that persist in the soil for years. While bees don’t bother with grass, if a homeowner decides to build a garden or plant bee-friendly clover in tainted soil, the bees will be exposed. Homeowners are planting flowers in their yards thinking they’re helping bees and they’re basically planting plants that poison them. Researchers have concluded that no one factor is the cause of CCD. Most likely, CCD is caused by multiple factors. However, several organizations have come together in an attempt to protect the bee industry by an appeal against EPA for its approval of the pesticide Sulfoxaflor, shown to be “highly toxic” to honey bees and other insect pollinators, and which scientists across the globe have linked as a potential factor to widespread and massive bee colony collapse. Sulfoxaflor was granted a full registration by EPA for most crops (including fruits, vegetables, corn, soybeans, barley, and canola), many of which require pollinators. Many other registered crops are utilized by pollinators, including honey bees, as forage. Based on the approved registration, pollinators, especially honey bees, may potentially be exposed numerous times by labelled Sulfoxaflor applications as honey bees are moved across the country to pollinate crops, produce the nation’s supply of honey, and recuperate from the rigors of pollination. Pesticides applied to a crop make the whole plant poisonous to insects, including the nectar and pollen, which bees eat. At miniscule doses the pesticides can kill bees outright, but even at doses that may not kill immediately, they impair bees’ ability to breed, forage, fight disease, and survive the winter. By some counts, pollinators such as bees and butterflies are responsible for one out of every three bites of food Americans eat. Honey bees in particular are responsible for pollinating many of our super-foods: the berries, nuts, avocados, and many other colorful and nutrient-rich fruits and vegetables that make up the healthiest parts of our diet. Bee populations are plummeting. A new meta-analysis of 800 peer-reviewed studies, released by the IUCN’s Task Force on Systemic Pesticides is calling for action to restrict the use of neonics. At the end of the day, the honey bee crisis is a human health crisis. If we can’t save bees, we can kiss goodbye the most nutritious part of the food pyramid. 1. Be educated. 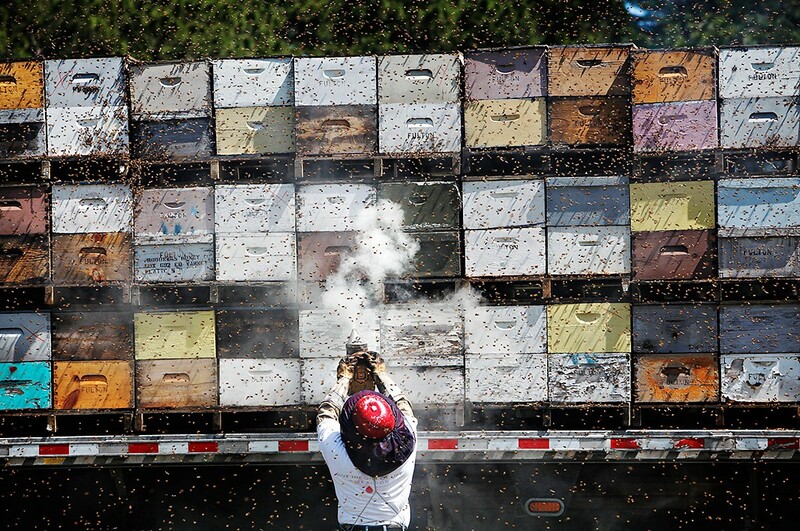 Read up on issues that affect the environment, like the current situation with honey bees. 2. Tell others what you know. Speak up! When your friends and co-workers are talking about important issues, share what you know and what you believe. 3. Advocate for change on a large scale: write a petition. It seems like a small thing to do, but petitions really do create change on a political level! Our government needs to hear what the people want. They won’t represent us well if they don’t hear from us. 4. Create change on a small scale: as an individual, buy organic. Seek out sustainably-sourced food products. In this case, look for almonds, avocados (foods produced via the use of honey bees) and corn and other products that typically use the type of pesticides which harm honey bees. If you garden or plant flowers, make sure your purchases and choices are organic, or safe for bees! P.S. Here’s something else I found interesting. Ever wondered how honey is made? 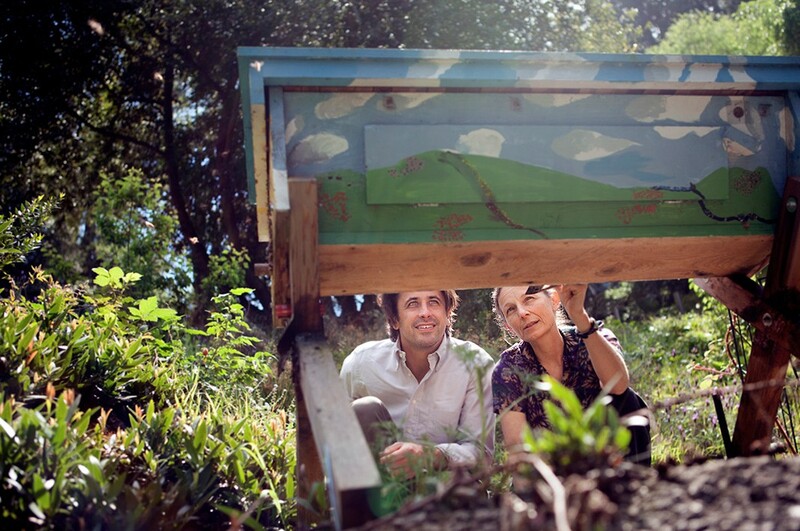 A healthy hive has 30,000 bees, 94 percent of which are the female worker bees. The worker bee’s job is to go out to the flowers and gather nectar from the blossoms to bring back to the colony. The nectar mixes with an enzyme in the bees’ mouth and is deposited into the honeycomb in the hive. The nectar naturally has high water content, but the bees help to evaporate the excess water by fanning their wings over the honeycomb. 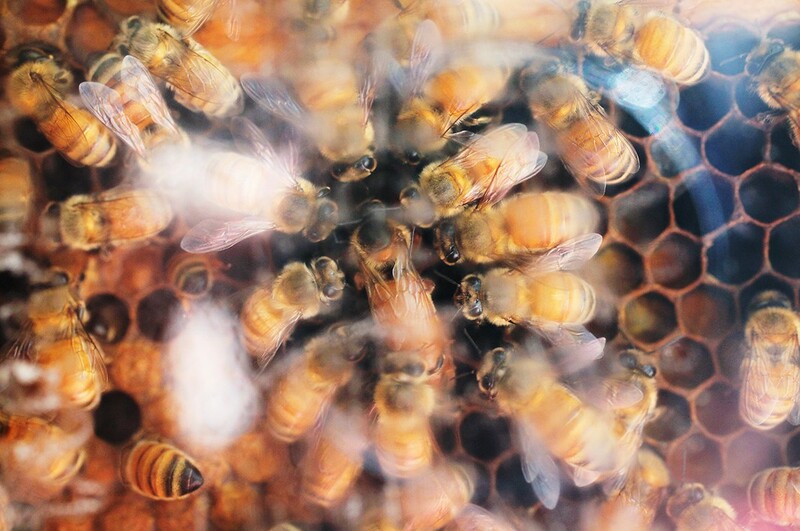 Once the liquid turns into a thick syrup, the bees cap the hole with wax. During the long winter months when there are no flowers, the hive survives by feeding off the capped honey reserves.